After use of a fan, a couple days of drying and a try-on, it's finished! 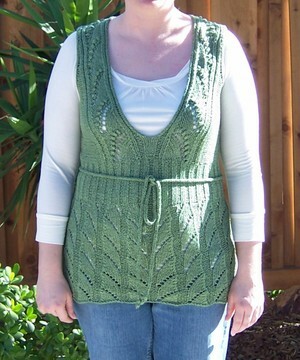 Yarn: Berroco Bonsai in Satsuki Green (#4149). I used 9 hanks plus some of another, leaving almost three left over. Needles: Addi Turbos, US7s and US5s. I had to decrease my needle size due to gauge. Alterations: Instead of the bind-off sequence for the neck shaping, I decided to give short row shaping a go. I really liked the resulting final bind off at the edge - nice and smooth, no stair-stepping effect. This made the seaming of the back extensions from the front portion a breeze. Impressions: Considering this tunic only took two weeks to fall into the FO list, I guess you could say I really liked knitting it! The resulting fabric of the yarn after blocking was impressive. The garment has a very good drape with a silk-like hand. I'm curious to see how it will hold up during wear as it seems heavy while holding up the garment by the shoulders, but not heavy while wearing. It actually feels really lightweight, something that I can definitely wear during the warmer months. Also, there does not seem to be any stretching in length due to this heaviness during wear, something that I've seen in knit silk garments. 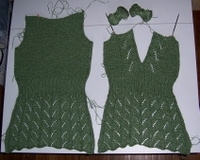 Normally I would have blocked the pieces first then complete the seaming. I decided to switch the order on this one because of my how my swatch behaved after washing. The Bonsai yarn (bamboo and nylon) has a really nice drape as it comes off the hank and is a bit crisp when knit up. But after washing it had even more drape and almost a silk-like fabric. Really quite lovely. I was afraid that the drapey-ness (is that even a word?) would work to my disadvantage while seaming... making it almost fiddly to work with. So, the seaming came first. The blocking second. I have high expectations for the fabric after it is dry. 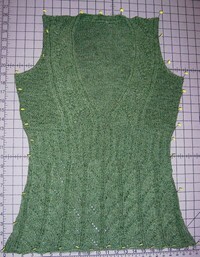 I was really impressed by my swatch and I am hoping that the results will carry over to the final garment. But let me tell you, it is going to take a couple of days for this to dry. The bamboo just soaked up the water and made it extremely heavy and stiff. It's been a bit warm in San Diego this week, so hopefully that will work in my favor in speeding up the drying with the help of a fan. All that is left is to get that 70" of I-cord complete for the waist-tie! Maybe, with any luck, I'll have this one done at the end of the week! !